WHITEVILLE, NC: August 22, 1012 – “I love math!” stated Izzie Rogers, a kindergarten student at Columbus Charter School. She was referring to all the fun she was having shopping and calculating groceries at the K-3 Math Night at Food Lion in Whiteville. 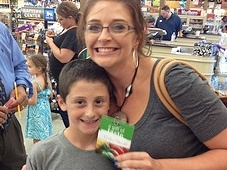 Columbus Charter School student Landen Allen and his mom, Lisa Garrell, show off the Food Lion gift card they received at Math Night. 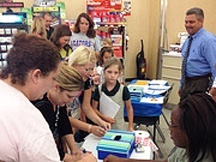 Food Lion provided math worksheets, tailored for each grade level, as students entered the store with their parents. CCS Administrators Steve Smith and Michelle Mena greeted them as well with instructions for the event. 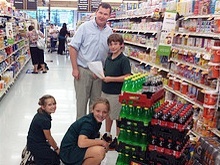 Students and parents worked together to complete their math sheet by searching for items and prices throughout the store. They used basic math facts for calculations and estimations. As they completed their sheets and turned them in, they were given a gift bag filled with goodies and directed to the deli for a hotdog, jello-cup and drink. Each parent and each student also entered their names into a drawing for prizes that were awarded throughout the event. Joshua Shaw, of Whiteville, went home as a very happy CCS second grader since he won the basketball goal he had his eye on as soon as he walked in the door. Columbus Charter School students Riley Gore, Jordin Stevens, and Autumn Roberson tally the math on the grocery list during Math Night. The Roger Bacon Academy – Columbus Charter School is a tuition-free, open enrollment K-7 public school in Whiteville, North Carolina. Since 2007, the school has focused on quality education and is a premier performance-driven year round school. Widely recognized as a compelling choice to conventional public education, the school has built a reputation for dedicated and highly qualified teachers that give students a strong and proven academic foundation. The Roger Bacon Academy schools have received numerous awards, including the designation of being a Top-25 School for Academic Growth and of Excellence in the state of North Carolina.